Traditional, in-your-face marketing methods have directly impacted trust between consumers and brands. For context, in 1984 people saw about 2,000 ads per day. By 2014, people were seeing upwards of 5,000 every day. This constant bombardment has made consumers hyper-aware of sales pitches and overly aggressive marketing. In fact, people often seek to avoid these ads entirely: more than 615 million devices currently have ad-blocking software installed on them. Today, you have to be strategic about how you market yourself to the public in order to earn and hold their trust. And where traditional marketing tactics may fall short, content marketing thrives. That’s because content marketing dictates you think about the value you provide your target audience above all else, not what you’re “selling” them. Putting your audience first, and constantly delivering relevant, useful, and valuable content, can help you build trust with them. 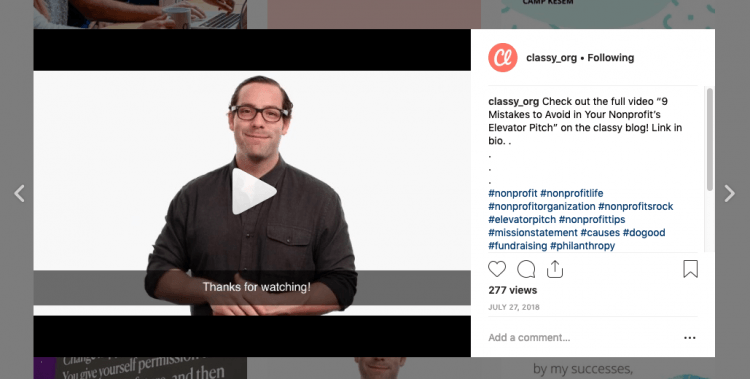 In this post, we’ll go over how content marketing can help establish trust and improve your nonprofit’s metrics, drive brand awareness, draw in new supporters, and establish your thought leadership. 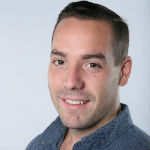 Then, we’ll walk you through 4 content marketing examples to demonstrate how you can make the most of your efforts. 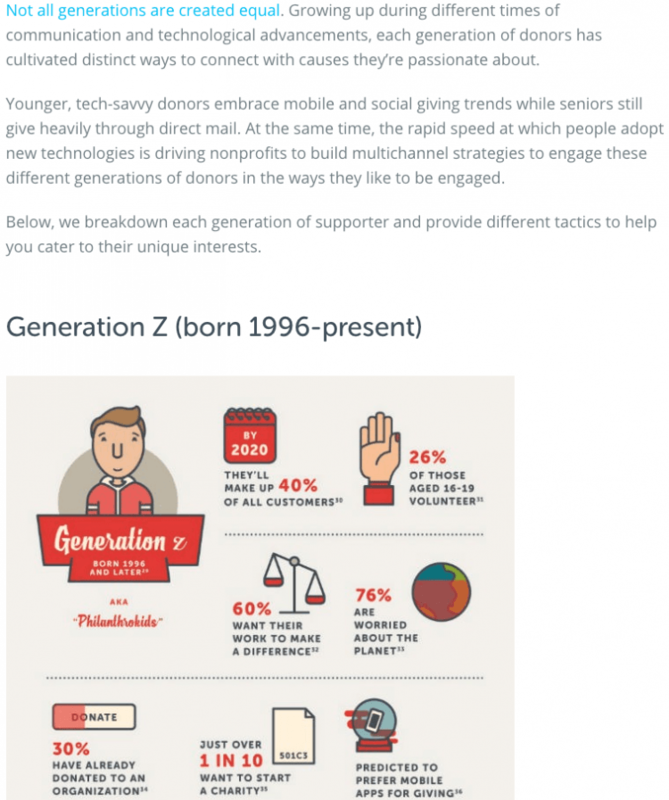 How Can Content Marketing Help Your Nonprofit? Regardless of what you create, the key to success is to focus on the needs and wants of your audience. Always ask what value this content brings them and why they should care about it. It’s also important to note that content marketing is a long-term effort, so remind your team to be patient while awaiting results. Before we dive into our examples of content marketing, there are a few quick tips to keep top of mind. It’s important you set specific goals around your content marketing efforts: what do you intend to accomplish? 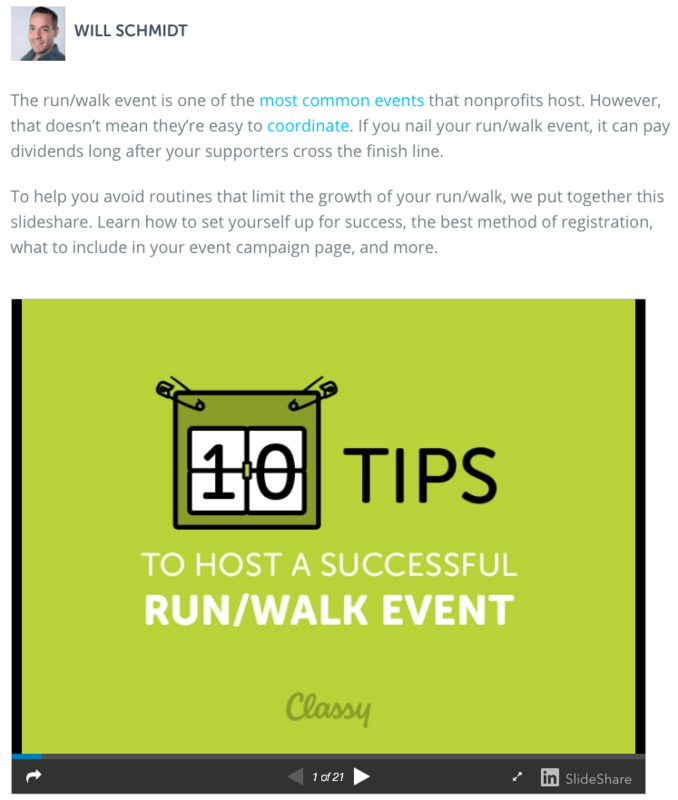 For example, maybe your overall goal is to drive traffic to your fundraising campaign pages. When your goals are clearly defined, you can consistently create content that serves these goals. Without this definition, you run the risk of delivering off-message assets that may hurt more than they help. It’s crucial you establish a consistent cadence of blogs, marketing email sends, and social media posts. Then, put it in a central place your entire team can see. 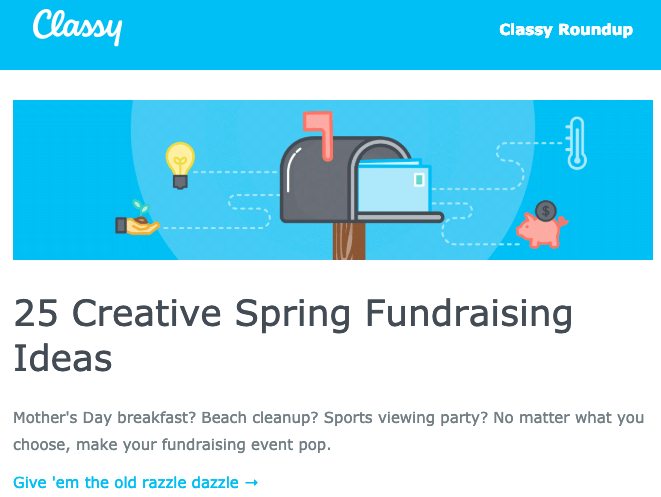 First, this helps avoid oversaturation issues, like sending three emails to your audience in one day. Second, this consistency helps build that foundation of trust between you and your audience. If you publish blogs every Monday, Wednesday, and Friday, your audience expects content on those days. The more consistently you deliver, the stronger the trust between you and your audience can become. Breathe new life into existing content or make new assets pop with lively designs. Creating content with design elements in it also opens up new doors to market your content across various channels. For example, you can take an old blog post filled with a lot of text or data points and turn it into an infographic. This infographic could be more engaging and shareable for your audience than a text-heavy blog post. 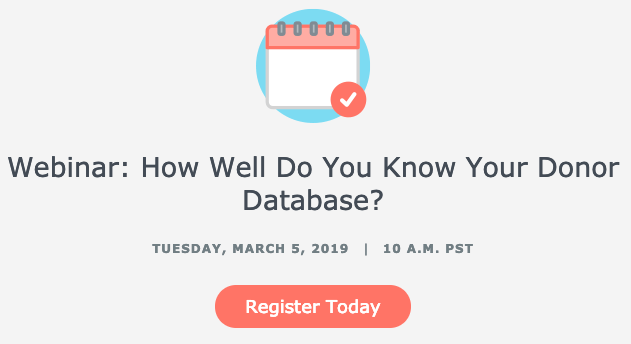 From there, you could also take screenshots of the infographic and publish small segments of it on your social media channels with a strong call-to-action to click back to the full blog post. Building off the previous point, you don’t always need to reinvent the wheel with your content. What do you already have that you can remix and reuse? Don’t be afraid to update old blog posts and republish them with new information or take power quotes from your podcast guests and include them in an email to your supporters. Very quickly, you’ll notice that one asset can become many. To help inspire your content marketing creativity and strategy, we outline four real-world examples from our own efforts below. Every Tuesday morning at 8:30 a.m. PST we send out a weekly content roundup. Our subscribers receive an email with the blog posts that have been published in the last week, new resources or guides, webinars, and other announcements. Our creative content marketing comes into play in the way we arrange the content in the email, the graphics we use to make it visually exciting, and the copy that teases the content. …or our annual Collaborative event. The roundup is a huge driver of traffic to our blog, and every Tuesday we notice a major spike in people coming to our site from the email send. What’s more, these are qualified visitors that engage with our content, buy tickets, and download resources. This blog post was published in 2015, but it continued to earn organic traffic and social media engagement. So, we decided to update it with some fresh content. We asked: How can we add more value to this post and make it even more relevant for our audience? 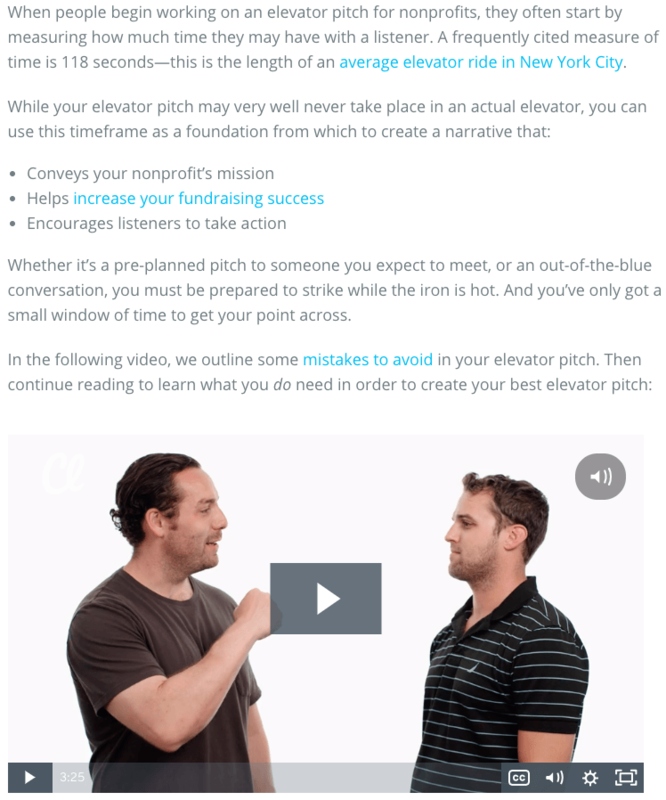 Our answer was to show nonprofits what an elevator pitch looked, felt, and sounded like by making a video. This was an incredibly fun project, but we made sure to balance the humor with value. People came for the humor but stayed for the actionable insight on how to create and deliver an elevator pitch. 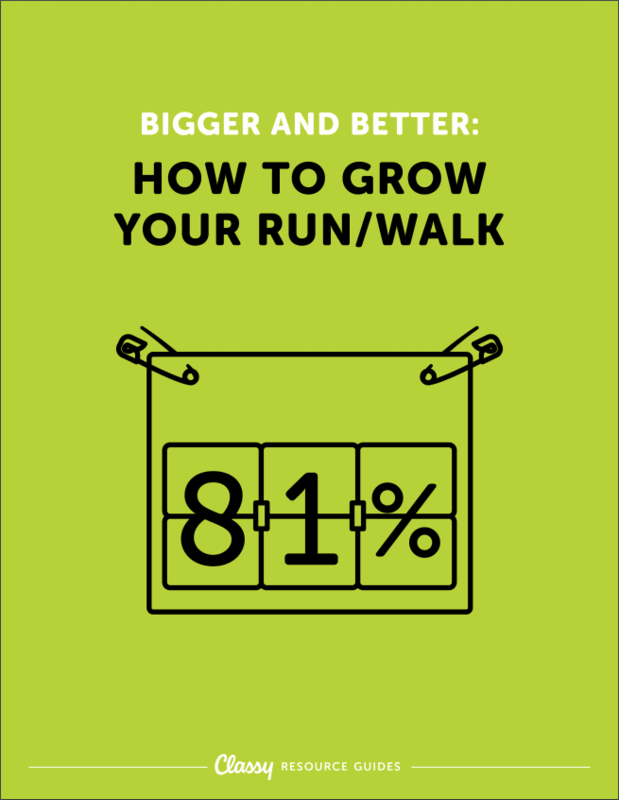 Initially, this was created as a long-form guide, but given how popular the run/walk event is we wanted to make it easier for people to discover this content and download the full guide. We decided to use SlideShare because it’s a highly interactive platform that showcases graphic design content very well. You’ll notice the design aesthetic remains the same across the guide and blog post to ensure our audience knew the content was related despite changes to the titles. We created a sticky web of content that someone could land on, where all roads eventually led to a download. Infographics are a great way to convey a lot of data and information in a digestible way. At the same time, they’re great candidates for reusing on multiple platforms. Depending on the way its designed, your infographic may have organic breaks where you can naturally chop them up into pieces for specific use. You’ll notice that each generation here has a break point and can stand on its own in the wild without the rest of the graphic’s context. No matter where you are in your content creation and marketing journey, the tips outlined in this post can help infuse creativity into your work and yield assets that stretch far across your marketing channels and improve your metrics. As you go, remember to set clearly defined goals, publish consistently, incorporate design, and use what you already have. 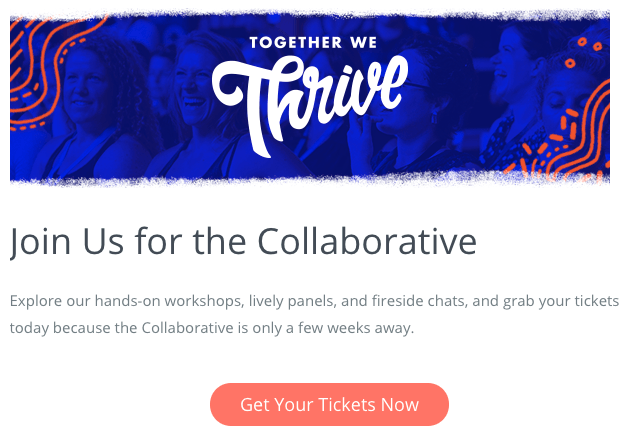 If you’d like to learn even more about developing your nonprofit’s content marketing strategy, make sure to join us for the Collaborative in Boston this June.